Did you know that the Greek root of the word “ecology” means “house”? If everyone created a healthy, green environment in our homes, it would extend to the greater good for the planet. My evolution into environmentalism began with caring about endangered species issues to natural beauty products to vegetarianism to green cleaning. Seventh Generation and the Children’s Health Envrionmental Coalition’s Blue Buttefly.org have teamed up to create a green cleaning guide for safer homes titled Naturally Clean: The Seventh Generation Guide to Safe & Healthy, Non-Toxic Cleaning. Case for Change at Home: These chapters are about the chemicals in household cleaners and the negative effects they have on our health, including cancer, asthma, hormone disruptions, and multiple chemical sensitivities (MCS). Like almost anything else, there is a good side and a bad side to all the molecular manipulation chemists practice. There are safe chemicals, and there are unsafe chemicals. Our problem today is that we don’t really know which are which. Household Chemistry 101: This section examines the chemicals found in our homes. The “bad behavior” of household chemicals are discussed from biodegradability to persistence to bioaccumulation to synthesis to potentiation. What happens, for example, when you use a petrochemical spray cleaner around your bathroom and rinse its remains down the sink? What happens in your home’s atmosphere when you install a rug and fill your home with that “new carpet” smell? The Dirty Secrets of Household Cleaners: There are many loopholes in cleaning product labeling, and many of the ingredients have not been subjected to adequate testing to determine chronic exposure risks. For example, antibacterial cleaners’ active ingredients are actually classified as pesticides by the EPA. In fact, these products work so well, it’s impossible to imagine cleaning without them. Yet perhaps we should, because behind their cheerfully sparkling labels of crystal mountain streams and field of wildflowers waving in the freshest breeze, all too many household cleaning products hide a dirty little secret: they’re made from synthetic chemicals that are toxic to people and dangerous to use. A Better, Healthier Way to Clean: From baking soda to olive oil, a core list of do-it-yourself natural cleaning ingredients is explored. Other simple ideas are given to limit your exposure household chemicals, such as keeping your dishwasher closed for an hour after it has completed its cycle. Nobody wants to come home to a castle that’s anything less than clean. On the other hand, it’s abundantly clear that the modern cleaners we’ve been relying on to make short works of all our housework are dangerous at best and downright deadly at worst. Where exactly does that leave us? The answer is simple: in the hands of Mother Nature. Kidstuff: This is why I clean my house with natural ingredients: the kids! Children experience greater exposures to household toxins than adults. Simply put, children are most susceptible to the dangers presented by the chemicals in consumer products. Compared to adults, they have a far greater chance of developing health problems as a result of exposure to toxins hiding in everything from cleaning products to toys. If we’re vigilant when it comes to our own health, we need to be hyperprotective when it comes to safeguarding our kids. Breathing Easier Indoors: Indoor air quality is of course affected by household cleaning chemicals. There are approximately 900 contaminants found inside American buildings. “In fact, the air inside our homes is often far more polluted than the air just outside its walls.” The good news is Naturally Clean lists the “Top 20 Air-Purifying Plants” so you can clean the air in your home naturally. Recommended Products: The toxicity, including acute and chronic, of many natural brands of cleaning products are listed in table form. Knowing what brands are safest is the first step to changing your cleaning habits at home. 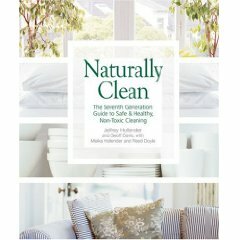 There is so much information in Naturally Clean: The Seventh Generation Guide to Safe & Healthy, Non-Toxic Cleaning! Even though this book is a guide from Seventh Generation, it is not a book promoting their products. It provides compelling evidence for switching to safe cleaning products and room-by-room guides to help you make your home healthier for your family. This looks like a great book to have on hand. I know that I’m trying to detox my house and am always looking for good resources to learn from. One book I’ve found especially helpful is Green Goes With Everything by Sloan Barnett. I had no idea how badly some of the stuff in my house was affecting not only the environment but my health and my children’s health as well.